My name is Yutaka. 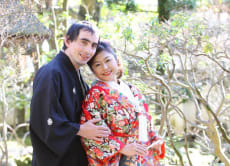 I provide traditional kimono experience for weddings & Japanese Kaiseki lunch. I want newlywed people & couples to enjoy this experience. My professional team welcomes you. The members are my wife Chiyuki & her reliable partners. Chiyuki is a freelance wedding planner. I am a restaurant manager. We promise you a satisfactory & memorable experience.